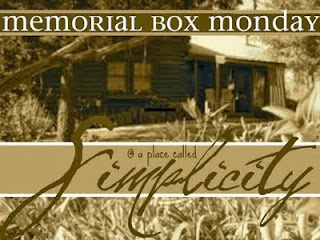 Linney who blogs at A Place Called Simplicity has challenged her readers to share a "Memorial Box Monday" post- here is my contribution. When I first started thinking about what memory I would want to write about, my thoughts went the small box I keep in my closet that's labeled "Saves". Sky's baptism dress is in there along with both of their first pairs of shoes and Sky's first drawing of our family. I thought I would write about the shoes, since I have first shoes for both Sky and Fire, that I would reminisce about how Sky always wanted to be carried until we put that first pair of shoes on her feet. Once she was wearing those little white sandals on her feet, she walked everywhere. I thought I would share about how much Fire hated his first pair of shoes, how he kicked and kicked his little feet trying to get them off. Maybe I could even get the kids to hold still long enough to get a picture of them now with their tiny shoes. And whenever I see those shoes, those precious memories of my children will come back to me but what I really want to remember and share today is what I'm feeling right now, this crazy combination of joy and sadness, acceptance and despair, that I'm feeling as we try come to grips with the fact that Uncle will die. There is joy because I know he believes in Jesus and will be going home. He will be well and whole in the presence of God and that's a wonderful thing. I am devastated to the point of tears that he won't be well and whole with us any more. My kids need their grandfather here with them and while he'll be in Heaven watching over them, in the moment that's only a small comfort. There is acceptance because this is Uncle's decision. He's choosing not to fight for more time than God gives him, and there is despair because none of the treatment options we explored for him worked out. I want this feeling to stay, to remind me to spend as much time with Auntie and Uncle as we can before they go to Majuro. I want it to remind me to cherish all of my family and to remember what a blessing they all are in my life. I want it to remind me what a gift our family recieved when Uncle welcomed us into their lives. He and Auntie didn't have to accept us- they could have even fought Fire's adoption but they didn't. They chose to adopt all of us into thier family, to teach us the Marshallese language and culture, and to laugh through all of our differences and find a common ground. I want to wrap this feeling up and store it next to my kids shoes, next to Sky's dress, and save it forever. I know that it will fade over time but I never want to forget it. Thank you so much for sharing your heartfelt journey. I am sorry for the anticipated loss of Uncle, such heartache. I pray that God will comfort and heal your hearts. Awww, that sense of looming loss. I went through it early this year when my grandma had a severe turn of health. She too as a Christian would be meeting Jesus but I wanted to hang onto her. When she died the loss wasn't any "easier" either. However, I understand that feeling of wanting to hold onto love, to give love, to savour memories in the making. Sending you much comfort and love and wishing you a lovely weekend.